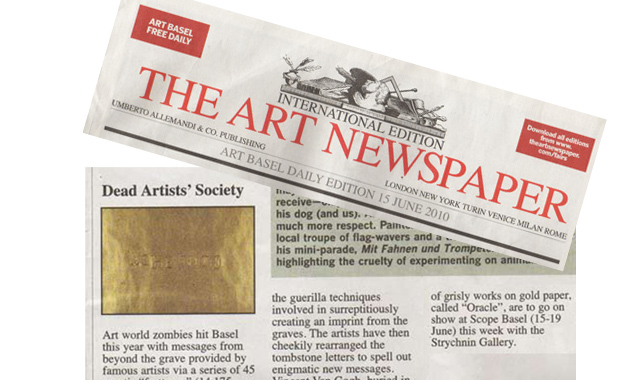 Art world zombies hit Basel this year with messages from beyond the grave provided by famous artists via a series of 45 cryptic “frottages” (14,175 Swiss francs each) ghoulishly made up from letters found on their tombstones. The technique, pioneered by the duo BORIS+NATASCHA, is dubbed “Grave Rubbery” because of the guerilla techniques involved in surreptitiously creating an imprint from the graves. The artists have then cheekily rearranged the tombstone letters to spell out enigmatic new messages. Vincent van Gogh, buried in Cimetière d’Auvers-sur-Oise, has become “Ache Into”, while German-born artist Hans Bellmer, at rest in Père-Lachaise, Paris, has morphed into “Be Her Man”. The series of grisly works on gold paper, called “oracle”, are to go on show at Scope Basel (15-19 June) this week with the Strychnin Gallery.